(Newser) – Nine striking dining hall workers at the world's richest university were arrested Friday after holding a sit-in to demand better wages and health benefits. 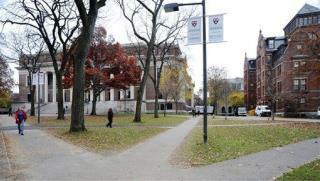 The workers—who are among 750 food service workers on strike at Harvard—were arrested alongside two union officials after blocking the streets of Harvard Square, the Boston Globe reports. The arrested workers, all women, were charged with disorderly conduct and will appear in court Monday, when more protests are planned, reports the Harvard Crimson. The workers say health care costs have become unaffordable, especially since many of them only work eight months a year, when all the dining halls are open. Limousine Liberal scum just like their Queen Hillary. They're working conditions are terrible. How can the cafeteria workers expect to live off of $37,000 with benefits slopping food on a plate. Sure the Denny's down the road they do it for $16,000 a year with no benefits, but the Uni 'is' rich and it's their responsibility to pull me up from poverty! If they don't like only working 8 months a year. They shouldn't have gotten a seasonal job.